In western medicine, we define healing as “the act or process of curing or of restoring to health” and we typically envision that as physical healing. We seek to take away fever, manage blood sugar and reduce blood pressure. Obviously, these are only some examples of the outcomes people might hope to achieve when visiting a clinic, hospital or Emergency Department. But what if the healing being sought was not physical? What if the ailments suffered resulted from a deep psychological, spiritual and cultural weight? What if, along with those burdens, came barriers to trusting those who want to provide healthcare? How then, would we seek care at a clinic, hospital or ER? Would we even bother to seek care at all? This is just a small window into the questions that must be explored when working at Cherokee Indian Hospital in Cherokee, North Carolina. Nestled in the Great Smoky Mountains of Western North Carolina, this 20-bed Hospital faces what the Cherokee people call “Rattlesnake Mountain.” In addition to in-patient and emergency services, the organization provides a dental clinic, eye center, physical therapy, complimentary Medicine (massage, chiropractic services, acupuncture), behavioral health services and wound care. While these services are impressive, they are not highly unusual for a Hospital. In order to understand the true depth and beauty of healthcare in this facility, one must be willing to journey into the past and be open to redefining healing by discovering a new way of approaching healthcare. Meeting with the Cherokee Indian Hospital Leadership Team, passionately headed by Casey Cooper, CEO, is a different experience than most leadership team meetings. The vast majority of conversation was devoted to understanding the long and painful history of the population this hospital primarily serves: the Eastern Band of Cherokee Indians. The history of the Cherokee people is one with many twists and turns. This is a tribe of people who are highly progressive, intellectual, innovative and are known for self-deprecating humor. Theirs is the story of a people who once were numbered at approximately 50,000 and lived in nine of the southern states across 250,000 square miles. In the early 1700’s, that number dropped to 9,000 due to both the smallpox brought by Europeans and enslaved Africans and the scorched earth campaigns. Because of this devastation, heading into the 1800’s, the sentiment among the Eastern Band of Cherokee Indians was that they had “no past and no future” because so many of their elders and children had died. In order to hold on to some of the land the Cherokee people deemed sacred, they had to agree to give up citizenship and therefore give up the protection that came with that citizenship. “The Indian Adoption Project” became a practice of removing Cherokee children from their homes and families because “white men know better” and these children were carried off in baskets with no recourse for the Cherokee people to protest or retrieve their babies. Cherokee boarding schools were created and actively worked to stop Cherokee children from speaking in their native tongue and strip them of their cultural identity. In addition to the broader history of the Cherokee people, Cherokee Indian Hospital also acknowledges that western medicine itself – including the Cherokee Indian Hospital specifically – is a source of historical trauma for the Cherokee people. Because of the inter-generational narrative that goes with this health system, it was clear to the leadership that the foundation of providing healthcare in this community had to be rooted in trust. In order to better understand how trust could be built, the leadership turned to the Elders of the Cherokee Tribe for help with the organization’s Guiding Principles. The Elders engaged in this process were both fluent in Cherokee language and the core values of the Cherokee people themselves. Cherokees have been mislead and mistreated over the centuries by opportunist disguised as well-meaning subject matter experts. For this reason, to be effective in this community requires genuine, evident commitment to the best interest of the community. Cherokee believe that all things endeavor to achieve this ultimate state of peace where all things are in balance and as they should be. CIHA believes “to hi” can only be achieved through healthy relationships and is fundamental to living healthy lives. Cherokee, like most Native Americans, enjoy the first pre-purchased healthcare in this country. Healthcare was purchased by ancestors through treaties with the United States, as recompense for the atrocities that resulted from horrific “Indian Policy” in this country. CIHA believes that all health care services belong to the people and CIHA is a steward of their inheritance charged with safe guarding it and providing it to them when and how they need it. CIHA is committed to being the healthcare partner of choice for this community enjoying the relationships found in healthy families. 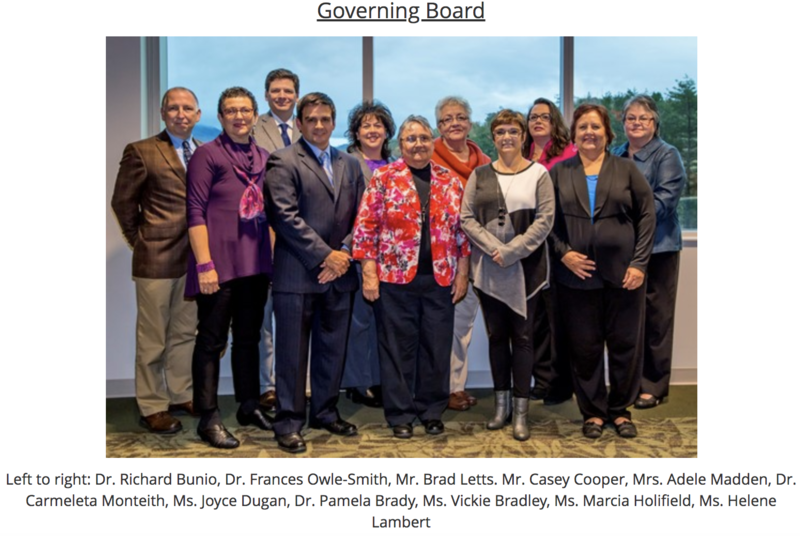 Once the Guiding Principles were established, leadership began to look at ways to embed those core beliefs into the culture of those who serve the Cherokee population. It became clear that the next step was to design a Cherokee Indian Hospital Employee Training. Due to the community’s background and the focus on addressing trauma, the training that resulted is a full three-day interactive class called “The Right Way Experience” du yu go dv . While the concept of orienting new employees to the core values of an organization is not unique, the components of the Cherokee Indian Hospital training are highly innovative and customized. The foundation of the training includes methods for cultivating compassion/empathy for the self so that one may be better equipped to cultivate compassion/empathy for those served. As a companion to Guiding Principle One—U wa shv u da nv te lv, “The one who helps you from the heart”--trainees are provided concrete communication tools for, not only effective information sharing, but deep listening. One exercise used to develop better listening skills is based in positive inquiry and involves trainees to sit in a circle, share a personal story, listen to other stories and respond to the stories told in the spirit of learning with compassion. A primary component of this training was built to ensure new employees are well-informed about the traumatic history of the Eastern Band of Cherokee Indians as well as have a working knowledge of how the hospital’s systems were designed to help those suffering from that trauma. This foundation ensures all employees within the organization are ready to do what is required to participate in the healing process for their community. In October of 2015, a new building was unveiled with more than 700 community members who attended the ribbon cutting and pre-opening events. There were more than 1,000 community members that attended the events and participated in tours of the facility as it was being built. The building is not only a proud achievement because it was funded despite lack of government support, but because it is a reflection of the deep commitment Cherokee Indian Hospital has to healing a community. Please provide a flat parking lot for those who have trouble with mobility. Please provide a drive-up pharmacy. Healing must be facilitated by the space. The hospital can’t compete with the natural environment. These practical items were honored and the building now has a flat parking lot and a drive-up pharmacy. Creating a healing environment in which both the beliefs of the Cherokee people and the healing power of nature were the focal point is largely what makes this building so extraordinary to behold. Pulling up to the building, one immediately begins to see unusual details. Carved on the sides of the building are wind symbols and flowing water symbols – two of the four most powerful forces in nature and ones that embody movement and transformation. The glass on the exterior of the building has been intentionally glazed so that it reflects the mountains surrounding the building. Perhaps most eye-catching is the atrium section located in the middle of the building. 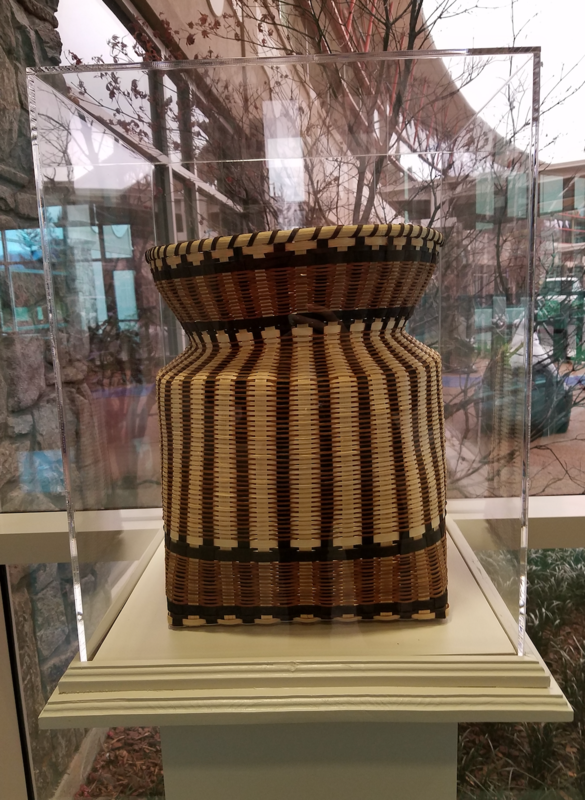 This architectural shape was designed to mimic the basket design of Maddie Wildcatt, a tribe member who currently resides in Cherokee, NC, and is well-known for her beautiful baskets. The actual basket is located in the main lobby. 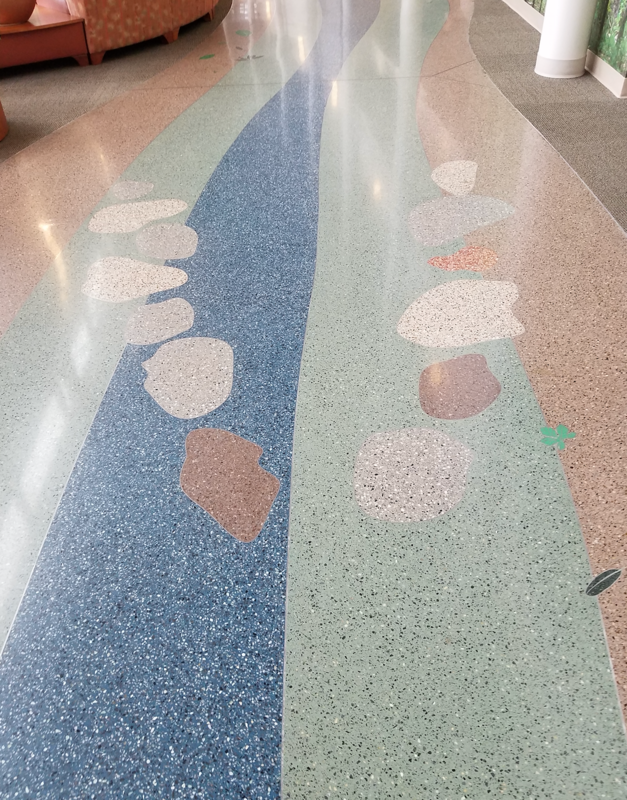 Entering the main doors of the hospital, one is greeted by a bold “water spider” in the floor tile; the first of many artistic representations of Cherokee Legend. Walking the main hall of the building, the floor is an artistic depiction of flowing water or a stream. Inside this stream is a series of graphic creatures and elements of the earth that guide the pathway. Some of the Cherokee Legends one encounters are the “Hell-Bender Water Dog,” the Salamander and Water Beetle. Pictured here is “fishware,” a likeness of a stone structure assembled by hand to catch fish. The purpose of these and other eye-catching images is to remind those walking these halls of the resiliency of the Cherokee people. The attention to creating a healing environment is not only found in what one sees walking through the halls or sitting in waiting areas, but also by what one does not see. Effort was made to ensure stress-inducing sites are taken behind closed doors. A patient waiting in one of the clinic waiting areas, for example, will not see IV poles, sirens or EMS trucks. These anchors of stress have been strategically routed to be “off stage” as a way of reducing “wait stress.” In addition, great effort has been made to ensure queuing stations in all areas are not isolated, access to all clinical areas has been made equal-walking distance from an exterior door and nature’s views and/or elements have been infused all over the hospital to inspire strength and healing. Tremendous effort was taken to bring nature into the space, pay homage to the culture and legends of the Cherokee people and reduce stress as much as possible. The level of thoughtfulness, partnership and dedication it took to co-design the space is both obvious and moving to anyone walking through the hallways of this organization. 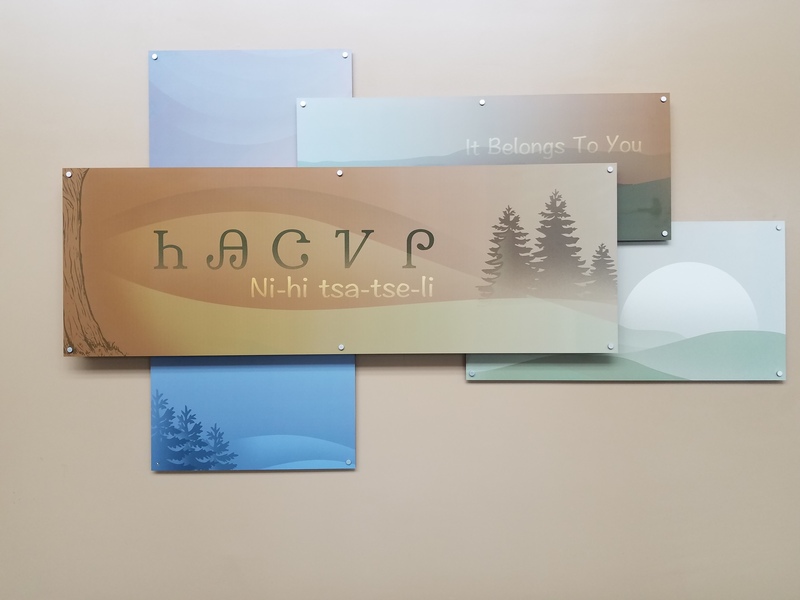 The Leadership of Cherokee Indian Hospital attributes much of their wisdom to studying the work done by the South Central Foundation in Anchorage Alaska. Specifically, the Alaska model helped to guide the redesign of their Primary Care delivery. At the foundation of this philosophy is the understanding that, “when acuity is high, system control is high and when acuity is low, patient/family control is high.” Building off of this understanding comes the recognition that relationship-based care is the key to making both acute and non-acute care interactions successful for everyone. The process of building trust is one that will span years and happen across generations. In part, this is due to the fact that Western Medicine is not fully trusted or understood by some members of the Cherokee Tribe. Most Cherokee people come from a family in which they “got doctored” at home unless or until the illness became very serious. Traditional therapies such as yellow root for fevers and squirrel brains for tooth aches are still a part of the Cherokee culture today. Due to some of the permeating narratives among tribe members, patients who do get sick enough to seek western medical treatment may not choose to go to Cherokee Indian Hospital but, rather, seek care at a hospital in a neighboring community. This breakdown in trust has been a primary focus for both leadership and the Patient/Family Advisors working at Cherokee Indian Hospital. Efforts to co-design care and the new hospital’s architecture have served to build new bridges and the efforts have paid off. Today, there is a significant increase in the utilization of the hospital/clinics/ER. In an effort to provide and expand excellent clinical care, the organization has added services specifically designed to address trauma. Among these are acupuncture, healing touch and massage. Soon mindfulness training will be added to this impressive list of approaches to healing both body, mind and spirit. The complexity of history, emotion and desire to heal a community’s traumatic past at Cherokee Indian Hospital is a story bigger than one that can be fully captured in one On the Road. Visiting this organization is truly a life-changing experience. Walking the halls with Cooper, one is met with warm smiles and big greetings. Talking with the Patient and Family Advisors, one sees people working to speak on behalf of many, even if they are too disenfranchised to join the conversation. This is not a utopia, there is much more healing needed, but it is a place of great inspiration. In a time where patient experience can be seen as a box to check or a desire to improve surveys, this Western North Carolina organization shines as a model for the true heart of Patient Experience: to reduce suffering in a loving and strategic way. The Beryl Institute extends sincere gratitude to this organization for its bold approach and ability to set an example for patient experience efforts across the globe.